Omaha Magazine remembers World War II in its May-June 2017 issue. This is the second of two stories I wrote for that issue that I’m posting on my social media. Omahans Shawn Schmidt and Jill Anderson are putting aside their divergent political beliefs to collaborate on a documentary, “48 Stars,” that tells personal stories of World War II through the words and eyes of veterans and others who lived through that epoch. Members of the Greatest Generation tell their own stories in a locally produced documentary, 48 Stars. 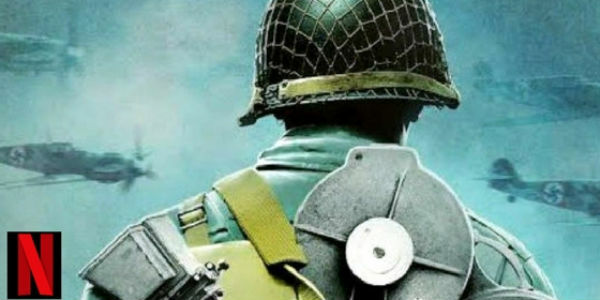 The in-progress film features personal testimonies from World War II veterans. War buff Shawn Schmidt conceived the project. His co-director is Jill Anderson. The Omaha filmmakers are unlikely collaborators. He’s a holistic health care provider and former race car owner-driver. She’s a singer-actress. He’s unabashedly patriotic. She’s not. But they’re both committed to telling authentic stories of resilience. Originally hired as music director, Anderson’s role expanded. 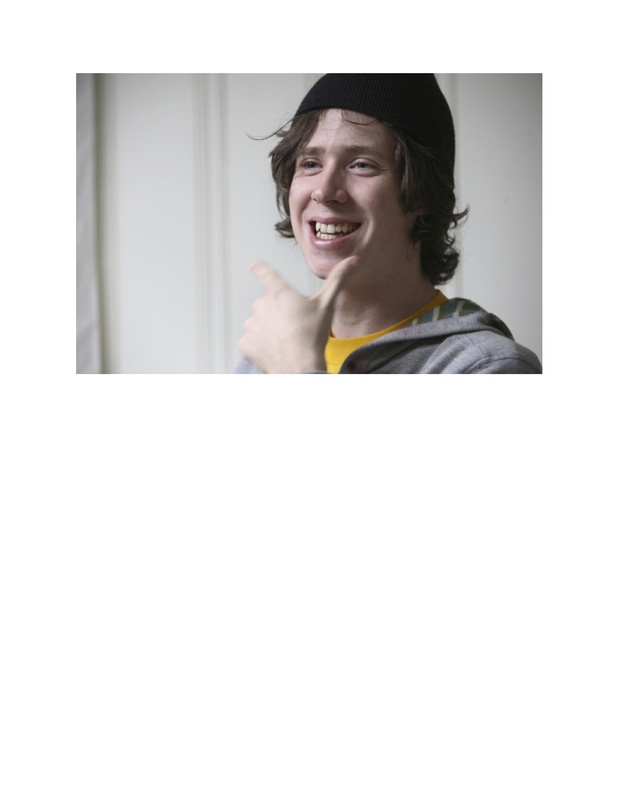 Filmmaker Aaron Zavitz joined the team as editor and creative consultant. Forty-plus interviews were captured nationwide, mostly with veterans ranging across different military branches and racial-ethnic backgrounds. Some saw combat. Some didn’t. Civilians were also interviewed about their contributions and sacrifices, including women who lost spouses in the war. Even stories of conscientious objectors were cultivated. Subjects shared stories not only of the war, but of surviving the Great Depression that preceded World War II. With principal photography completed, editing the many hours of footage is underway. The filmmakers are still seeking funding to finish the post-production process. 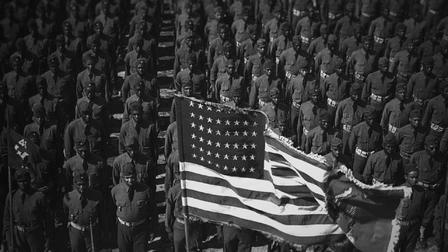 The film’s title refers to the number of stars—representing states—displayed on the American flag during World War II. Each interviewee is framed with or near a particular 48-starred flag that inspired the project. Schmidt rescued it from a junk store. On a visit to Pearl Harbor’s war memorials, he had the flag raised on the USS Arizona and USS Missouri. He grew up respecting veterans like his late father, Richard W. Schmidt—a Navy Seabee in the Pacific theater. His father died without telling his story for posterity. “It dawned on me I could interview other veterans and have them hold this flag, almost like a testimonial to what this piece of fabric is about,” Schmidt says. He added that combat veterans’ accounts of warfare teem with emotion. “There’s a distinct difference in energy, pain, and identification with their country and flag from the ones who did not have to kill. The ones who did kill are still hurting, and they’ll hurt till the day they die,” he says. There are tales of love and loss, heroism and hate, improbable meetings, close calls, intersections with infamy, history, and fate. Not all the attitudes expressed are sunny. Some folks became anti-war activists. Others returned home to endure Jim Crow bigotry. Schmidt feels an urgency to finish the project. “The generation that has the most to teach us is leaving,” he says. He won’t rush it though. Visit 48stars.org for more information. Omaha Magazine remembers World War II in its May-June 2017 issue. This is one of two stories I wrote for that issue. It tells the story of the late Wendell Fetters through the eyes of his grandson, Omaha filmmaker Ben Drickey, who accompanied his grandfather on a trip to Europe visiting the sites of some intense and bittersweet wartime experiences. The emotional trip gave Drickey, who was there to document it all, a new path for this life’s work. His footage of that experience brought things full circle for his grandfather and gave his family the precious gift of an intimate look back into the past. Filmmaker Ben Drickey’s lifelong fascination with history turned personal in 2001. That’s when he documented his grandfather’s return to Germany, revisiting the sites where the U.S. Army Air Corps serviceman crashed and was captured during World War II. Drickey’s video of the emotional trip has only been seen by family, but the project inspired him to make video production his career after years working with still photography and politics. Today, he creates documentaries and branded film content through his studio, Torchwerks. Growing up, Drickey was spellbound by family patriarch Wendell Fetters’ stories of being a tail-gunner on a B-26 Marauder flying with the 9th Air Force, 391st bomb group. On an ill-fated daylight bombing run during the Battle of the Bulge on Dec. 23, 1944, his plane crossed the English Channel and delivered its payload over the Ahrweiler bridge. Enemy artillery and fighter flak killed the left engine, igniting a fire, but the crew bailed out before the plane went down. Fetters’ chute pitched him into a tree. The impact broke an ankle, but he cut himself down. Alone, injured, and afraid, the 20-year-old Iowa native took a sun reading and hobbled west behind enemy lines in sub-zero cold and snow. Two days later, militia captured him. A family housed him over Christmas, and he spent the next four months in a POW camp before the war in Europe ended. After a stay-over in England, he came home to resume his life. He worked, married, and raised a family. Fast forward nearly six decades. Drickey was attending a family reunion, where he learned of his grandfather’s plans for returning to Germany to visit the plane’s crash site. German amateur historian Hermann Josef Stolz found its debris and used a piece stamped with identifying information to trace the plane’s manufacturer, bomber group, and crew. He invited Fetters to come pick through remnants. “The rest of us were totally intrigued and we quickly realized this is a once-in-a-lifetime opportunity,” says Drickey, who, along with his mother, two aunts, and an uncle, joined his grandparents on the summer 2001 trip. Drickey went as a video documentarian even though he was strictly working as a still photographer at the time. “I had no formal experience creating a moving image. I borrowed a friend’s camera and pirated a copy of Final Cut Pro. But I just knew I had to go do it,” he says. With Stolz as guide, the Americans traveled to the site, where a cross memorializes the remains of the pilot, Jack Haynes, who died in the crash. Even all this time later, Drickey says, “pieces of fiberglass, aluminum, and rubber” are strewn about. “I was picking up things to take home.” He displays one piece on his desk in the Mastercraft Building. 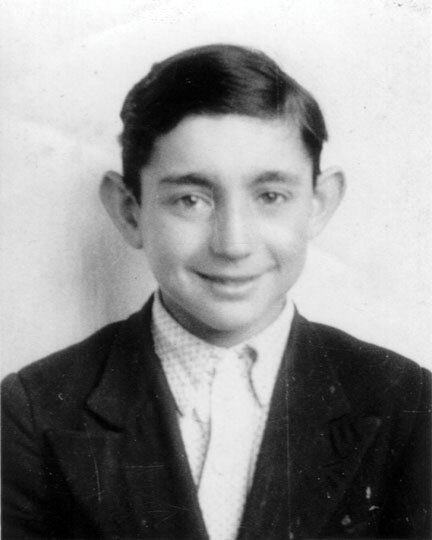 The Americans next went to the nearby two-story wood and stucco farmhouse of Josef Hayer, the man who—at age 14—first arrived on the scene of the 1944 crash. Hayer had salvaged things from the smoldering debris. Among his finds was a tailpiece with a yellow triangle on a canvas peak. Fetters then wanted to return to Eisenschmitt, the village his captors paraded him through to the home he was billeted in. He recalled a tannenbaum atop a table and framed photos of two German Army conscripts hanging on a wall. He was fed dinner and slept in the barn, then he was taken to the rail depot for transport to the POW camp. After nearly giving up the search for the home all those years later, Fetters noticed a familiar landmark. Sure enough, just beyond the hill sat the house. Through translation, the elderly woman occupant said she remembered that war-torn Christmas when an American airman was brought to the house. She was 9 years old then. She recognized Fetters standing before her 56 years later. She explained that the uniformed men in the photos were her brothers, and the pictures still hung in the same spot. She invited Fetters to see for himself. He refused. As the visitors drove off, the woman hurried behind clutching oranges as a gesture of friendship. She handed them to Fetters. A family meeting ensued. Fetters held firm. Drickey explained he’d come too far not to go back, so he did. “In my business, I would rather beg for forgiveness than ask for permission most of the time,” Drickey says. He filmed inside the house and interviewed the woman, one of many interviews he conducted for the project. The experience gave him a career path and archived a precious family legacy. “I’m so glad I did it. It was such a learning experience for me about myself, my eye, and my ability to capture an image,” he says. “So many things happened on this trip,” and Drickey says he can only appreciate them all by re-watching the footage. Drickey has gone on to produce slick corporate videos, commercials, and short films. He also worked as cinematographer on the feature film It Snows All the Time, but nothing compares to that first personal project. His grandfather—the airman who also served in the Korean War—passed away July 31, 2015. Visit torchwerks.com for more information. 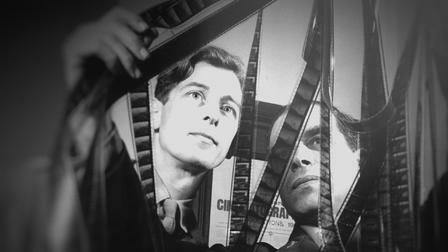 When the United States entered World War II these five great Hollywood filmmakers were asked by the government to apply their cinema tools to aid the war effort. They put their lucrative careers on hold to make very different documentaries covering various aspects and theaters of the war. They were all masters of the moving picture medium before their experiences in uniform capturing the war for home-front audiences, but arguably they all came out of this service even better, and certainly more mature, filmmakers than before. Their understanding of the world and of human nature grew as they encountered the best and worst angels of mankind on display. 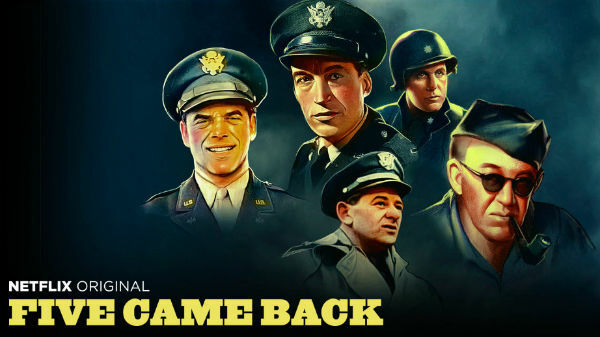 The story of their individual odysseys making these U.S, government films is told in a new documentary series, “Five Came Back,” now showing on Netflix. The series is adapted from a book by the same title authored by Mark Harris. The documentary is structured so that five contemporary filmmakers tell the stories of the legendary filmmakers’ war work. The five contemporary filmmakers are all great admirers of their subjects. Paul Greengrass kneels at the altar of John Ford; Steven Spielberg expresses his awe of William Wyler; Guillermo del Toro rhapsodizes on Frank Capra; Lawrence Kasdan gushes about George Stevens; and Francis Ford Coppola shares his man crush on John Huston. More than admiration though, the filmmaker narrators educate us so that we can have more context for these late filmmakers and appreciate more fully where they came from, what informed their work and why they were such important artists and storytellers. As World War II begins, five of Hollywood’s top directors leave success and homes behind to join the armed forces and make films for the war effort. Now in active service, each director learns his cinematic vision isn’t always attainable within government bureaucracy and the variables of war. At the war’s end, the five come back to Hollywood to re-establish their careers, but what they’ve seen will haunt and change them forever. Ford was a patriot first and foremost and his “The Battle of Midway” doc fit right into his work portraying the American experience. For Wyler, a European Jew, the Nazi menace was all too personal for his family and he was eager to do his part with propaganda. 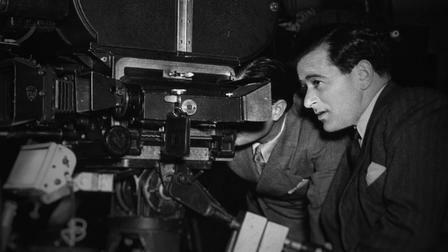 For Capra, an Italian emigre, the Axis threat was another example of powerful forces repressing the liberty of people. The “Why He Fight” series he produced and directed gave him a forum to sound the alarm. 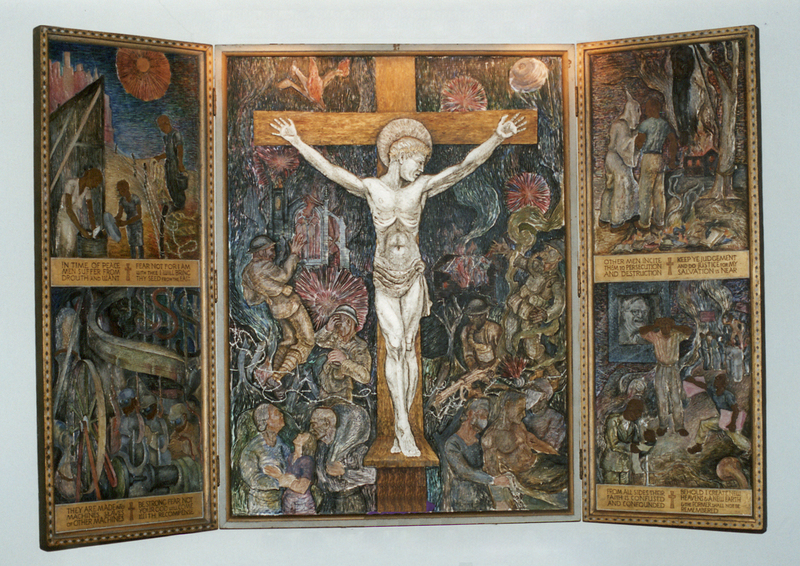 A searcher yearning to break free from the constraints of light entertainment, Stevens used the searing things he documented during the war, including the liberation of death camps, as his evolution into becoming a dramatist. Huston made perhaps the most artful of the documentaries. His “Let There Be Light” captured in stark terms the debilitating effects of PTSD or what was called shell shock then. His “Report from the Aleutians” portrays the harsh conditions and isolation of the troops stationed in Arctic. And his “The Battle of San Pietro” is a visceral, cinema verite masterpiece of ground war. The most cantankerous of the bunch, John Ford, was a conservative who held dear his dark Irish moods and anti-authoritarian sentiments. Yet, he also loved anything to do with the military and rather fancied being an officer. He could be a real SOB on his sets and famously picked on certain cast and crew members to receive the brunt of his withering sarcasm and pure cussedness. His greatest star John Wayne was not immune from this mean-spiritedness and even got the brunt of it, in part because Wayne didn’t serve during the war when Ford and many of his screen peers did. Decades before he was enlisted to make films during the Second World War, he made a film, “Four Sons,” about the First World War, in which he did not serve. Following his WWII stint, Ford made several great films, one of which, “They Were Expendable,” stands as one of the best war films ever made. His deepest, richest Westerns also followed in this post-war era, including “Rio Grande,” “Fort Apache,” “She Wore a Yellow Ribbon,” “The Searchers,” “The Horse Soldiers” and “The Man Who Shot Liberty Valance.” Another war film he made in this period, “The Wings of Eagles,” is another powerful work singular for its focus on a real-life character (played by Wayne) who endures great sacrifices and disappointments to serve his country in war. Wyler, famous for his many takes and inability to articulate what he wanted (he knew it when he saw it), was revered for extracting great performances. He didn’t much work with Method actors and I think some of his later films would have benefited from the likes of Brando and Dean and all the rest. One of the few times he did work with a Method player resulted in a great supporting performance in a great film – Montgomery Clift in “The Heiress.” Indeed, it’s Clift we remember more than the stars, Olivia de Havilland and Ralph Richardson. Frank Capra was the great populist director of the Five Who Came Back and while he became most famous for making what are now called dramedies. he took a darker path entering and exiting WWII, first with “Meet John Doe” in 1941 and then with “It’s a Wonderful Life” in 1946 and “State of the Union” in 1948. While serious satire was a big part of his work before these, Capra’s bite was even sharper and his cautionary tales of personal and societal corruption even bleaker than before. Then he seemed to lose his touch with the times in his final handful of films. But for sheer entertainment and impact, his best works rank with anyone’s and for my tastes anyway those three feature films from ’41 through ’48 are unmatched for social-emotional import. Before the war George Stevens made his name directing romantic and screwball comedies, even an Astaire-Rogers musical, and he came out of the war a socially conscious driven filmmaker. His great post-war films all tackle universal human desires and big ideas: “A Place in the Sun,” “Shane,” “Giant,” “The Diary of Anne Frank.” For my tastes anyway his films mostly lack the really nuanced writing and acting of his Five Came Back peers, and that’s why I don’t see him in the same category as the others. In my opinion Stevens was a very good but not great director. He reminds me a lot of Robert Wise in that way. That list includes two war films, “The Red Badge of Courage” and “Heaven Knows Mr. Allison,” that are intensely personal perspectives on the struggle to survive when danger and death are all around you. Many of his other films are dark, sarcastic ruminations on how human frailties and the fates sabotage our desires, schemes and quests. I believe Huston made the most intelligent, literate and best-acted films of the five directors who went to war. At least in terms of their post-war films. The others may have made films with more feeling, but not with more insight. Huston also took more risks than they did both in terms of subject matter and techniques. Since the other directors’ careers started a full decade or more before his, they only had a couple decades left of work in them while Huston went on making really good films through the 1970s and ’80s. Clearly, all five directors were changed by what they saw and did during the war and their work reflected it. We are the ultimate beneficiaries of what they put themselves on the line for because those experiences led them to inject their post-war work with greater truth and fidelity about the world we live in. And that’s really all we can ask for from any filmmaker. In the late 1990s a man I never heard of before, the late Ben Nachman, called to encourage me to start interviewing and profiling Holocaust survivors living in and around Omaha. Ben was a retired Omaha dentist who lost his entire extended family to the Holocaust. He set about a life’s mission to record survivor stories and that journey led him to amass a large collection of books on the topic, to befriend researchers, to become an official Shoah Visual Archive interviewer and to enlist me to capture and publish individuals’ stories. I ended up telling some two dozen Holocaust stories, mostly about survivors but also about rescuers, educators and scholars. I also wrote about Ben’s passion for doing the work he did in bringing Holocaust stories to light. Ben introduced me to many remarkable individuals. Thanks to him I was privileged to share the testimonies of survivors, the heroics of rescuers who saved others and the depths of experiences that shaped the Holocaust. Several years ago the Institute for Holocaust Education in Omaha acquired some of these stories for visitors to read on its website. In this post are links to those stories and to other Holocaust stories I have written. Founded in 2000, the Institute has a goal to ensure that the tragedy and history of the Holocaust is remembered. The nonprofit organization provides appropriate, fact-based instruction and materials to students, educators and the public to enhance Holocaust studies in the hope of inspiring communities to create a more just and equitable society. The IHE has reached hundreds of teachers and more than 100,000 students in Nebraska, Iowa and Kansas with its educational resources, workshops, survivor testimony and integrated arts programming. The Institute also supports Holocaust survivors in our community. As much as I enjoy writing about the arts and artists, I equally enjoy writing about athletics and athletes. 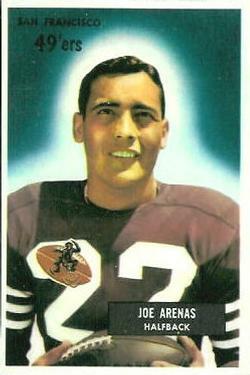 I finally caught up with a former football great from Nebraska, Joe Arenas, who has never really gotten his full due. If the name isn’t familiar, it’s because his professional and college exploits happened about 60 years ago. And though he was a very fine player – so good that he is still among the NFL’s all-time leaders in career kick return average – his jack of all trades verstality as a returner, running back, receiver, and defensive back made it hard for him to really stand out except as a returner. When you come right down to it, how many returners other than maybe Gale Sayers, Travis Williams, Brian Mitchell, Eric Metcalf, and Devin Hester really made a dent in the national consciousness? Sayers was of course a great running back in addition to being a great returner. The other thing working against Arenas was that he had two future NFL Hall of Fame teammates, in Joe Perry and Hugh McElhenny, who got most of the offensive touches out of the backfield. Before playing pro ball Arenas starred in the single-wing at then-Omaha University, where again he did a little of everything. In the single-wing Joe played a half-back spot in that offense but he did everything a quarterback does. Before he ever played college ball Joe served as a U.S. Marine in World War II. He was wounded at Iwo Jima. My story about Joe for El Perico newspaper refers to the fact that Arenas was among a small number of Hispanic football players who made a mark in the game. I also reference how Omaha U., which today is the University of Nebraska at Omaha, is where another athlete of color, Marlin Briscoe, played quarterback in an era when that was very rare at a predominantly white university. What I didn’t mention in the article is that a third athlete of color with local ties, Wilburn Hollis, played quarterback at two mostly white institutions, first at Boys Town and then at the University of Iowa. I was delighted to find Joe a still vital man in his late 80s. The longer out it is from the University of Nebraska at Omaha dropping football in 2011, the more its gridiron greats recede into obscurity. No one should forget (Guadalupe) Joe Arenas.This son of Mexican immigrants was born in Cedar Rapids, Iowa and grew up in Lincoln, Neb. during the Depression. Small but determined, Little Joe didn’t play organized football until college yet he still made the National Football League. The high school basketball standout made the varsity hoops squad at the University of Nebraska before transferring to then-Omaha University, where he played both sports, becoming one of America’s most accomplished Hispanic athletes. He won All-American football honors as UNO’s do-everything offensive cog (1947-1950), averaging 200-plus yards total offense as a junior and finishing sixth in the nation in total offense as a senior. As the go-to back in the single-wing, a precursor to the spread formation, he received snaps from center, called plays, ran, handed-off, passed, caught and punted the ball. He returned kicks and played defense, too. Two decades later another athlete of color, Marlin Briscoe, became the first black starting quarterback at UNO and in the NFL. San Francisco made Arenas UNO’s first NFL draftee as an 8th round pick. He enjoyed seven productive years (1951-1957) at halfback, returner and defensive back. He once led the league in kickoff returns and retired as the all-time returns leader. He still ranks ninth in league history in career kickoff return average (27.3). After fielding the ball, he let his smarts, instincts and athletic ability take over, netting career marks of 3,798 kickoff return yards and 774 punt return yards. He brought back both a punt and a kickoff for scores. From scrimmage he compiled 987 rushing and 675 receiving yards and scored 16 touchdowns. He also threw a touchdown. 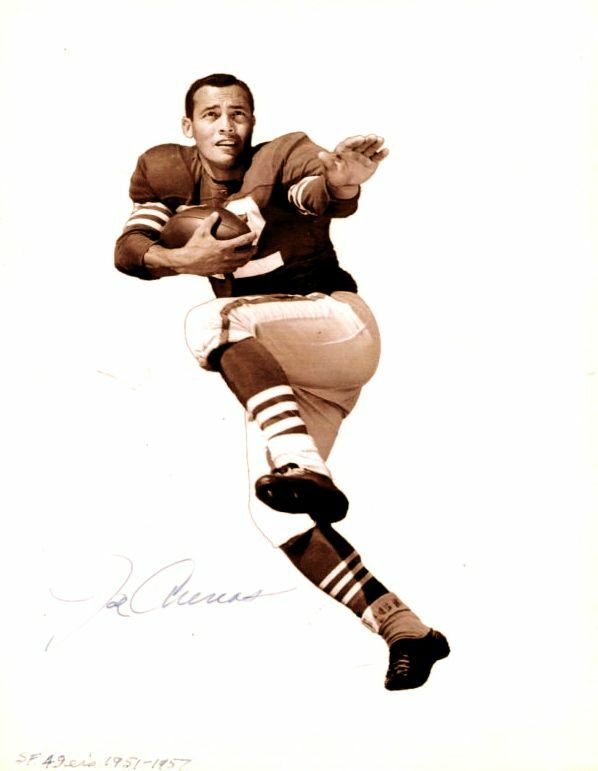 Upon leaving the 49ers he laid off two years to mend injuries before trying out with the Boston Patriots of the new AFL. He soon retired for good. En route home to San Francisco his back flared up and he recuperated in Houston, falling in love with his physical therapist. He stayed, they married and the couple raised two daughters. He remained in Texas coaching football, working with receivers for College Football Hall of Famer Bill Yeoman at the University of Houston. In the 1980 Cotton Bowl the Cougars upset Nebraska 17-14 when an Arenas receiver made the game-winning grab in the end zone with 19 seconds left. Arenas sent several proteges to the NFL. Long before any of that, he put athletics on hold and his life on the line serving in the U.S. Marines. He took part in the amphibious landing on the Japanese-fortified volcanic island of Iwo Jima, where he and his fellow “no guts-no glory” grunts staged the bloodiest assault of the Pacific theater. American troops storming the beach were pinned down under heavy fire. Arenas dug in and prayed. “I got hit the very next day. It was a shrapnel wound and they carried me down the beach, where I got evacuated, and I’m glad I did because that was quite some campaign there. Oh man, I’ll tell you, I was probably fortunate to get hit and get the hell out of there. All my buddies got shot up. He didn’t let his back wound slow his athletic career. He competed with the best, including three 49ers teammates who made the Pro Football Hall of Fame: Joe Perry, Hugh McElhenny and Y.A. Tittle. Playing in an era before collective bargaining and free agency, he never made more than $10,000. Like other players then Arenas worked a regular off-season job to make ends meet. He was a salesman for spice giant McCormick and Company. He “never thought” himself or the few other Hispanic players active then, like Tom Fears or Eddie Saenz, as groundbreakers. He’s proud Hispanics have since shined: Joe Kapp, Tom Flores, Jim Plunkett, Jeff Garcia. At 49er gatherings he’s met franchise legends John Brodie, Joe Montana, Jerry Rice. But there, like at UNO alumni events, few teammates are around. “There’s not too many left,” says Arenas, who at 89 is now a widower living in a Webster, Texas retirement center. He still enjoys watching the game on television, the coach in him critiquing players’ techniques and lack of hustle. He still signs bubble gum cards with his likeness on them that fans and collectors send him. Holocaust survivor stories come in every conceivable variety, just like the people and lives behind them. I’ve had the privilege of telling many such stories in the course of profiling survivors who settled in Nebraska after World War II or later. Each story, each survuvor, is distinguished by elements that make them singular. I thought I had heard and read it all when it comes to these sagas but then along came Milton Kleinberg’s story. There may be more dramatic or traumatic tales but I can’t imagine one that covers as much time and distance as his tale. It is epic in terms of sheer scale yet it’s also achingly intimate. I don’t pretend to capture more than just the surface of his story in the following Omaha Magazine (http://omahamagazine.com/) article, but it should give you a sense for the aamazing rc of his surivival experience. 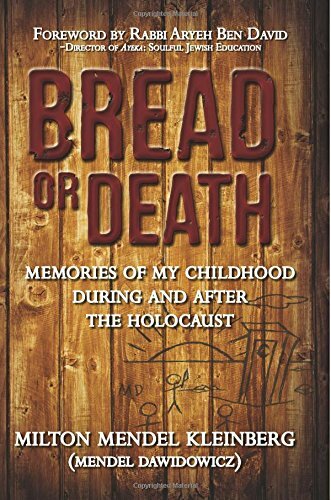 For a full appreciation of what he endured, you must read his book Bread or Death. As a child in Poland, Milton Kleinberg got caught up in a little known chapter of the Holocaust when he and his family were among Jews exiled to Soviet labor camps. The forced journey took them from occupied Poland to the siege at Stalingrad to the vast wastelands of Siberia. To be uprooted, thousands of miles from home, was awful, but it also meant being beyond the reach of death camps. The 77-year-old native of Poland and longtime Omaha resident endured many hardships. Forced to travel on foot and by train, he was confined to warehouses, barracks, and institutions. He witnessed starvation, disease, suicides, beatings, executions. He weathered illness, injuries, predators. The epic ordeal spanned thousands of miles and many years. He experienced things no child should face. To defend himself and others he took actions no one should have to take. His saga continued after the war in displaced person (DP) camps. After reinventing himself in Milwaukee, he went years not saying anything about his odyssey, not even to his wife and children. After moving to Omaha in his middle-years he still kept quiet. Keeping silent is not uncommon among the survivor community, for whom the trauma of loss is difficult to relive. Then circumstances conspired to break his silence. His grandchildren visited Holocaust sites and pestered him with questions. In applying for Social Security benefits he discovered his birthdate was different than what he thought it was. A genealogical search turned up two step-sisters, with whom he shared a father. The women posed more questions. Always alert to anti-Semitism and to events in Israel, which he’s visited several times, he’s grown concerned by the rise of militant, extremist elements around the world. Finally, he decided, he should recount his story. In 2010 he self-published Bread or Death. He gave it to friends and relatives as well as clients of his successful business, Senior Market Sales Inc., which employs more than 170 people. This past year he expanded the book with the help of professionals, including Institute for Holocaust Education staff who developed a teacher’s guide, a glossary, study questions, and historical background sections. IHE develops Holocaust curriculum for schools state-wide. Released in August, the new edition is available to schools and youth-serving organizations as an educational tool. IHE executive director Liz Feldstern says Kleinberg’s made a valuable contribution to understanding the Holocaust survivor experience. The memoir completes an obligation Milt felt to himself and his family. “Milt has fulfilled his responsibility admirably to share his story and break a lifetime of silence so that others can learn from that history…and hopefully not repeat it,” Feldstern says. Though reticent most of his life about his own experience, he’s never shied from confronting anti-Semitism. While residing in Milwaukee he actively opposed a neo-Nazi group there through the Concerned Jewish Citizens of Wisconsin, a group he helped form. It wasn’t the first time he stood up. He and his wife, Marsha, co-hosted a Milwaukee radio program. They bought the air-time for themselves in order to present and comment on Jewish news. His book is a cautionary tale of what occurred as the world slept. It may help ensure another holocaust doesn’t happen in this new era of hate. Ultimately, Bread or Death is a testament to how a life well-lived is more powerful than any retribution.